Fissler is one of the top brands for pots and pans. Founded by Carl Philip Fissler in 1845, this company has managed to keep its relevance in making cookware thanks to the quality and stylish products they make. With over 120 years of experience in making cooking appliances under their belt, they are among the best brands in the market. They began focusing on pots and pans in 1892 and currently, they are making pressure cookers as well. One of their latest products is Fissler Vitaquick Pressure Cooker, and today we will be reviewing it to see why it is one of the best pressure cookers in its category. The Fissler Vitaquick is a premium pressure cooker for both experts and beginners. Made in Germany, this pressure cooker has a thickened bottom to help prevent scorching. You can use it on a stovetop without ruining your meals and its polish. 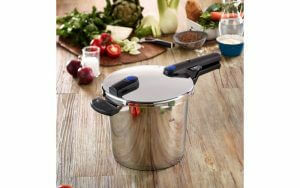 This pressure cooker can also be used with electric, gas, glass ceramic and also on an induction stovetop. Having been made from a combination of aluminum and stainless steels, this cooker is easy to clean and has a brilliant design. Fissler has definitely taken the safety of its device seriously, and this pressure is no different. This highly reputable brand know how dangerous steam can be when confined in a pressure cooker and that’s why they have taken serious safety measures. The perfected, auto-locking handle helps prevents the cooking process from starting, unless the handle is securely tightened as required. There is a locking mechanism indicator light which switches from red to green once the handle is securely locked in place and the lid is in its rightful position. This prevents any guesses and thus makes it a safe cookware. It also has a pressure relief valve that allows you to release pressure, before untightening the lid. This pressure cooker is made to last for a long time as its exterior is made from stainless steel which makes it stronger and durable. Fissler always inscribes its name on all their products and this one is no different. You don’t need to hide this pressure cooker because it has an amazing design that will provide a wonderful addition to your kitchen appliances. Its interior is made of aluminum, which is highly durable as well. 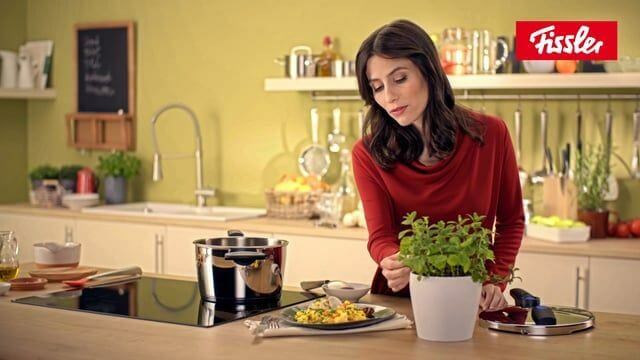 You will be shocked when you lift your new pressure cooker since it is extremely lightweight. It weighs 9.48 pounds, which is quite unusual when compared to most pressure cookers. However, do not let its lightweight nature fool you. Fissler Vitaquick is extremely durable and comes with a lifetime warranty. This pressure cooker was designed for busy people with limited time for preparing and cooking meals. The easily readable and clearly displayed volume markings allow you to fill the pot without worry of overfilling, which could be unsafe. The “min” mark shows the minimum amount of water that should be in the cooker for it to produce steam. The “max” mark shows the maximum amount of food and water that the pot can hold. Make sure to follow these rules to the tee to prevent any mishaps. The Fissler Vitaquick Pressure Cooker will take the place of your slow cooker and stove-top pot thanks to its two settings which offer speedy or gentle cooking. The readable blue indicator rod is perfect for individuals with poor vision and the elderly as you will not struggle to identify where it is. You will never have to guess the setting as all the controls are easy to set. Even if this is your first time using a pressure cooker, you will not experience trouble using this appliance thanks to its great features that make it easy to use. Firstly, it is easy to place the lid in the right position; you just need to place it on top and rotate to snap it shut. Once the lid is securely locked the locking light indicator will turn from red to green. Only when the pressure cooker indicator turns green, will the pressure start to build. Therefore, you can rest assured that this appliance will always be safe to use for everyone. Another feature that makes it easier to cook with are the safety lines on the inside, indicating the minimum and maximum fluid level to prevent overstuffing or under-loading your cooker. Right across from its handle, you will see a pressure knob that allows for two cooking levels. The first setting cooks fish and vegetables well, while the second setting cooks stews and meat to perfection. If you are cooking vegetables, simply add some water to the cooker and place your vegetables inside a perforated insert, place everything in the cooker and close the lid. There are a lot of information about what to cook and how to cook different recipes provided in the included cookbook. You can also refer to the manual that comes with this pressure cooker. Made of high-quality material, this pressure cooker from Fissler is designed to improve almost every aspect of your cooking. Its solid construction prevents it from making noise and leaking. Unlike traditional pressure cookers, Vitaquick allows excess steam to escape from the cooker to avoid pressure build up. It requires less energy for cooking because it is extremely efficient at conserving heat. Fissler Vitaquick Pressure Cooker also help you make healthier meals because they use steam from your food to cook your meals. You don’t have to use a lot of oil or butter for your cooking, resulting in healthier meals. It doesn’t corrode or rust because its interior and exterior are made of high-quality materials. This model is also compatible with induction cooktops as well as electric and gas stoves. There are several advantages to using this pressure cooker. One of the main advantages is the ability to cook your meals quickly and right. Also, it comes with a limited lifetime warranty to guarantee durability. Besides they are dishwasher safe for easy cleaning. The Fissler line comes with a nice range of sizes to fit a variety of needs. 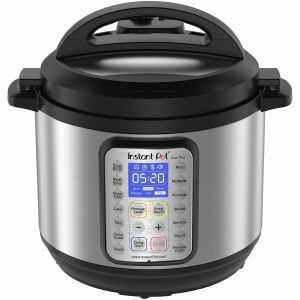 As always, quality attracts a higher price, and this pressure cooker is quite pricey as compared to most in its category. Overall, this is an exceptional product that is worth its price. An outstanding advantage of Fissler Vitaquick is that it is dishwasher safe. Many of the pressure cookers on the market today do not have this ability. And taking into consideration that the thickened bottom of this appliance is hard to clean by hand because of dried on foods, we must highlight this exceptional advantage. When it comes to top pressure cooker designs, Fissler Vitaquick Pressure Cooker is definitely one of the best. Once you own one, you will be swept away by how it looks and feels. Beyond appearance, this appliance is extremely easy to use. Fissler did a great job in designing this cooker. It might be expensive compared to many pressure cooker models in its category, but it boasts of plenty of useful features. It is UL certified and thus has met the industry safety standards. Having integrated safety with design and function, this pressure cooker is truly one of the best. It can be used on most cooking surfaces, has two pressure settings, and is easy to clean. 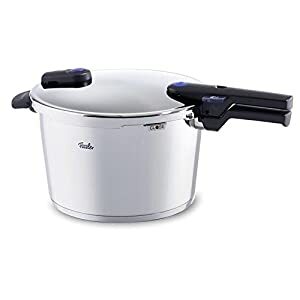 For those who are looking for a quality, durable, attractive, and easy to operate stove top pressure cooker, then Fissler Vitaquick is a great investment.